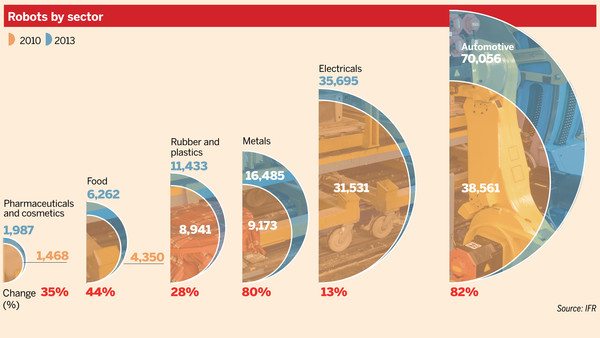 Industrial robots have been at use in factories for the past half-century. Historically, they were expensive robotic arms used in the automotive and manufacturing industry, kept apart from human workers in cages, for safety reasons. Today, industry leaders are striving to create a work-place where robots can work comfortably alongside human beings at a reasonable price. Long awaited technology advancements are finally gaining momentum and will provide launching platforms into a brave, new robotics world. Companies like Rethink Robotics in Boston, KUKA in Germany, and Google with its recent robotics acquisitions along with numerous robot component and software makers are leading the forefront in innovation. Research and Development (R&D) is spearheading the efforts. Federal and State research and development tax credits are available to shoulder the costs for both robot product sellers and robot purchasers integrating robots into their manufacturing operations. *Source: Financial Times Series, Army of robots are being primed to sweep into the workplace and home by Chris Bryant. Carnegie Mellon University, also known as the Robotics Institute is a worldwide hub of robotics research focusing on areas including machine learning, computer vision, fully autonomous cars, and automation. They have eight specialized research centers including the Center for Integrated Manufacturing Decision Systems which focuses on manufacturing and industrial robotics. At the institute's National Robotics Engineering Center, scientists are building forklift robots, ship-cleaning robots and other innovations for commercial robotics applications. At the manipulation lab they are developing versatile production robots that can perform a wide range of tasks from assembling camcorders to sorting papers on a desktop. Practical issues at the lab include discovering ways of constructing a plan in which the robot will use to achieve a specific goal to optimizing the use of information collected via sensors. The interactive robotics group at MIT is a research lab which develops innovative methods for enabling human-robot collaboration. Their vision is to harness the relative strengths of humans and robots together to accomplish what neither can do alone. The focus is to develop robots that work in teams with people in high-intensity and safety-critical applications, including industrial manufacturing where the goal is to improve the efficiency of the manual assembly process through human-robot collaboration. Baxter from the Massachusetts based Rethink Robotics is a dual-armed humanoid robot who can work alongside humans on the factory floors, adapting and making herself useful in any setting, for a variety of tasks. Typically, Baxter is used in "pick in place" settings where her job is to pick things off a conveyor belt and place them into a package or vice versa. She is named after medieval female bakers. She stands at just three feet tall, has two eyes, two arms and communicates her intentions through her digital flat screen face in an attempt by Rethink Robotics to humanize the robot so that workers feel comfortable interacting with her. Her ingenuity is created by software apps and updates that make her versatile enough to adapt to a variety of dynamic settings. It is all part of Rethink Robotics' mission to create smarter, more adaptable, low-cost solutions. She performs a variety of simple, yet critical production tasks while safely and intelligently working next to people. How? 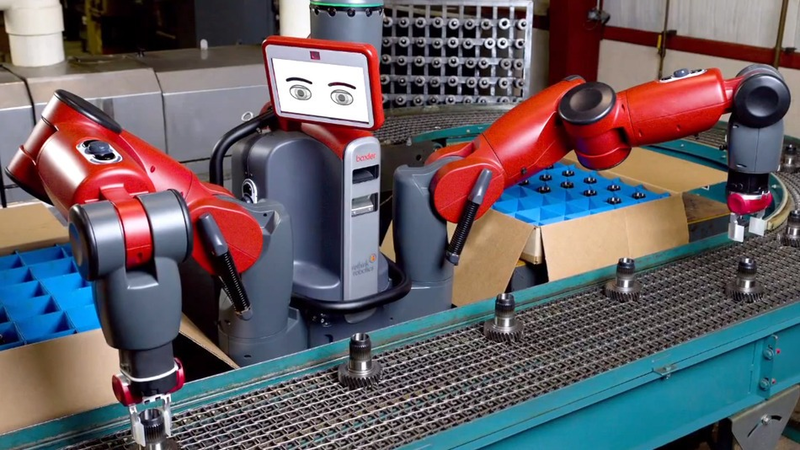 Unlike traditional industrial robots, Baxter exhibits behavior-based 'common sense,' capable of sensing and adapting to her tasks and environment. She requires no special training or expertise to program. One simply grabs the robot's arm and walks her through the motions. The Baxter then repeats the process on her own. And with her uniquely low price of around $25,000, Baxter provides a compelling alternative to low-cost off-shoring. As a result, Baxter is being introduced into a wide range of settings that could never previously consider robotic automation solutions. Other companies are mimicking the efforts well. KUKA, the German manufacturer of the one armed LBR or Leichtbauroboter (German for lightweight robot) describes their versatile robotics arm as iiwa "intelligent industrial work assistant". It is designed to automate delicate, complex assembly tasks that were once beyond the capabilities of earlier robots. It has sensors to optimize safety, fast teaching and simple operator control, three of the biggest concerns among industry leaders, whose ultimate goal is to create robots that can work safely and practically alongside humans. Modeled after the human arm it is designed to show greater sensitivity than some people. It is good for assembling small parts that weigh up to seven or fourteen kilograms depending on the model. 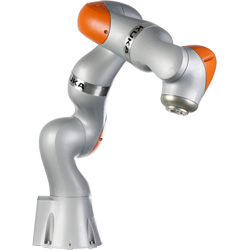 Other robotics companies are creating similar innovative, adaptive robotic arms as well. FANUC is one of the largest industrial robotics makers in the world. The Japanese company with major branches in the United States and Europe has installed over 240,000 robots in North and South America. Their stance on technological development is that "There is a history of technology, but for engineers there is no past. There is only creation" And they backit up too. Not only do one third of their employees - mostly young researchers - pursue research and development but they average over $40,000 in R&D expenses per employee, per year and almost $90,000 per employee in 2012. Most successful robotics companies understand just how critical R&D is to the industry. Yaskawa describes its R&D operations as "an obsession with Quality and Reliability" that is "designed in" products based on customer input and industry research. Their focus is on testing products intensively before introduction to the marketplace in order to reduce failure rates. And whatever expenses they incur during this process are eligible for a significant R&D tax credit. Universal Robotics sold its first robot in just 2009, called the UR5. The Danish company which later moved to the US also offers a more heavy duty model, the UR10. Both are six jointed robotic arms similar to the LBR iiwa. They have slightly less lifting capacity than the LBR models as they assemble parts weighing up to only 6 and 10 kilograms depending on the model. Universal, which is particularly strong in the injection molding industry, uses the robot arm in conjunction with their injection molding machine which allows the machine to work at full capacity for long periods of time - something that cannot be accomplished by human operators. Since this industry is regaining strength in the United States due to lower fuel costs Universal should be able to make wider use of its robotics arms in their manufacturing facilities. Both UR robots are in compliance with ISO safety requirements (the universal standard for collaborative robots) meaning that as soon as a human comes into contact with the robotic arm, it automatically stops moving. This technology is central to the industrial vision of creating safe robots that can practically function and interact alongside humans. Google has been very quiet about what it intends to with its robotics acquisitions but one thing is clear: if Google is interested in it, it's likely to be big. And the media has shown much interest by intensively covering the issue especially the Boston Dynamics acquisition in 2013. With this Google acquired a line of the most innovative bots in the world including the BigDog, LS3, Cheetah, and Wildcat. These robots are now part of Google's company culture which "encourages experimentation and the free flow of ideas". The emerging industry giant - "encourage[s] people to think big and aim for breakthroughs instead of incremental improvements." Google describes this as "moonshot research". Other large players in the industry are not timid to aim big either. Amazon recently made its biggest acquisition since it purchased Zappos in 2009 by acquiring Kiva Systems Inc. (a maker of robots that move items around warehouses) for $775 million. This move should allow Amazon to take advantage of economies of scale by incorporating more robots in their warehouses which produce the company's largest operating expense at $4.6 billion last year. Traditionally, warehouses have two main employee groups on the warehouse floor. Namely, pickers who pick merchandise off the shelf and packers who pack the goods for shipping. The Kiva robots essentially eliminate the pickers since the goods are automatically moved to the packing area. Rising labor costs in China have prompted the Taiwanese manufacturer of electronic goods, Foxconn (long known for its association and partnership with Apple), to seek assistance from Google in accelerating these automation efforts in their factories. In return, Google seeks assistance in integration of some of their recent robotics acquisitions. The Wall Street Journal reports Wang Wanli, an analyst at CIMB Securities, commenting on the issue - "Using robots to replace human workers would be the next big thing in the technology industry." Robots have already taken jobs cleaning the Sydney Harbor Bridge, a dirty job which required a team operating a sandblaster to immediately start cleaning at the other end once they finished the job in order to keep 485,000 square meters of steel pristine. Scientists at the Fraunhofer Institute for manufacturing, engineering and automation demonstrated a Care-O-bot that sweeps office floors and empties bins, a function that could replace jobs of janitors and custodians. The Tesla car manufacturing plant in Fremont, California is using flexible robots to perform multiple tasks such as installing seats and windows or sealing the body of the car. This is a big step from the traditional single task robots in the Detroit manufacturing facilities. The 160 robots work right alongside 3,000 human workers installing batteries, switching functions and reducing costs. Some critics think that robots will take our jobs, others say they won't. But, even if they do it might not be as bad as some suggest. Although they will replace the jobs of factory workers and crop pickers, they will vastly increase productivity, lower costs of production and open up doors for new and innovative opportunities better suited for more skilled people. Consequently, if productivity increases then jobs will open up in sales, marketing, robot maintenance and research and development functions. Economists have largely rejected the "lump of labor" theory (the idea that an increase in productivity reduces employment). Although the employment destruction position is attention-getting, it does not demonstrate any correlation between productivity and unemployment. Just look to the agricultural revolution; In 1900, 41 percent of the country was employed in agriculture. Modern technology has recently reduced that number to less than 2%. Even as women entered the workforce during the twentieth century, unemployment showed no long-term increase. The result of all this is that while new technology replaces certain tasks, it also creates new products and services which creates more innovative replacement jobs. It is not clear what the effect of robotics will be on the workforce; but laborers should try to avoid jumping to conclusions that robots will automatically put them out of a job. As the robotics industry emerges, innovative ideas will continue to drive the effort. ABB, one the world's premier engineering companies, states that "research and development is what continues to drive our business today" and lists "Driv[ing] innovation with a sustained commitment to R&D" as a core component of its mission statement. When a leading manufacturer already has existing complex manufacturing processes, integrating new high level robotic equipment requires experimentation and thoughtful process engineering specific to that company and its products. Process engineering such as this often qualifies for R&D tax incentives. Companies that design robots and components including software may be eligible for R&D tax credits, along with companies that integrate robotic solutions into their existing operations.